A Russian-Ukrainian Zenit-3SLB rocket on Oct. 6 successfully placed the Intelsat 18 telecommunications satellite into orbit from Russia’s Baikonur Cosmodrome. PARIS — A Russian-Ukrainian Zenit-3SLB rocket on Oct. 6 successfully placed the Intelsat 18 telecommunications satellite into orbit from Russia’s Baikonur Cosmodrome in Kazakhstan in the second commercial flight operated by Sea Launch AG in 12 days, Sea Launch and Intelsat announced. 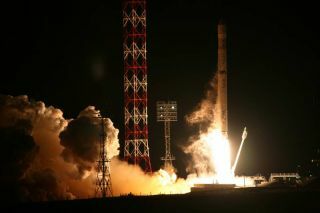 The Zenit-3SLB rocket, which is nearly identical to the vehicle Sea Launch operates more often from a floating platform in the Pacific Ocean, deployed the 3,200-kilogram Intelsat 18 some six and one-half hours after liftoff following three burns of the rocket’s Block DM upper stage. The rocket's liftoff marked the fifth mission for Sea Launch's land-based program, called Land Launch. Built by Orbital Sciences Corp. of Dulles, Va., Intelsat 18 will replace the Intelsat 701 spacecraft at 180 degrees west in geostationary orbit. Intelsat 18 carries 24 C-band transponders — 16 with 72 megahertz of power and eight at 36 megahertz — and 12 72-megahertz Ku-band transponders. Intelsat 18 has a coverage area centered over the Pacific Ocean to enable direct-broadcast television and other telecommunications services to customers from Southeast Asia to the western United States. French Polynesia’s postal and telecommunications department, which has been an Intelsat 701 customer, will be among those transferring to Intelsat 18, Intelsat said. Bern, Switzerland-based Sea Launch AG returned to flight Sept. 24 after more than two years under U.S. bankruptcy protection. The company was purchased out of bankruptcy by an affiliate of RSC Energia of Korolev, Russia, a major space-hardware supplier that manufacturers the Block DM upper stage. The Intelsat 18 contract had belonged to Sea Launch, but was transferred to Space International Services (SIS) following Sea Launch's Chapter 11 proceedings. For reasons that may relate to the availability of Zenit rocket hardware, SIS was unable to deliver on the promised launch date, and Intelsat subsequently returned the contract to Sea Launch. In exchange for securing an October launch of Intelsat 18, Intelsat agreed that its planned launch, by Sea Launch, of the heavier Intelsat 19 satellite from the mid-ocean platform would be delayed from late 2011 to mid-2012. Sea Launch used the Zenit rocket intended for Intelsat 19 for the Intelsat 18 mission.